Approximately one in every eight U.S. internet users have visited Amazon.com in the last thirty days. In all, that’s about 175 million unique visitors per month. Compare that number to your small business’s own website traffic, and it’s quickly obvious why listing your company’s offerings on Amazon is a great way to expand your business. But in addition to potential customer reach, Amazon’s wide range of back-end selling, business management, and distribution tools make it easy for businesses of all sizes to scale far beyond what they could otherwise do alone. If you’ve been thinking about using the Amazon Marketplace to expand your small business, read on and follow our step by step process to build an Amazon-centric business model that fits your company’s needs. Step 1: Choose a seller category. This will depend on the kind of business you run. Step 2: Create your Amazon seller account. This is when you’ll get your business registered to sell on Amazon. Step 3: Set up your seller profile. This is where you’ll let Amazon users know what your business is all about. Step 4: List, sell, and ship. This is the whole process selling on Amazon. We’ll break the details down in the process below. Successful Amazon Sellers have included nationally recognizable brand names, individuals sellers distributing thousands of units straight from their living rooms, and everything in between. It all comes down to how you choose to leverage the marketplace and the various Amazon services to fit your business needs. Regardless of scale, every new Amazon seller gets started by those four steps. Here are the details of what you really need to do to sell on Amazon. Sell as an Individual: If you own a very small business and plan to sell fewer than 40 items per month, you can sell as an individual on Amazon for just $0.99 per sale, plus a few other small selling fees. Sell as a Professional: Most small businesses will fall into this category. If you plan to sell more than 40 individual items per month, Amazon will charge a subscription of $39.99 per month, plus individual transaction fees. Your Legal Name and Address: Stored in your account for Amazon’s reference. If you are a registered company, it is important to use the exact name and address under which you are registered. Contact Information for Amazon and Customers: Amazon will use this information to contact you with order notifications, Guarantee Claim notifications, and service and technical updates. Customers will use your customer contact information to reach out with questions about your orders. Contacts for Amazon and customers can be the same or separate if you have a dedicated customer service email/telephone line. Where Products ‘Ship From’: This information will display underneath your product listing. Although your ‘Ship From’ location doesn’t change the shipping time or cost for buyers, some customers will use this information to make a buying decision between similar listings. Bank Account Information: Amazon delivers payments for products sold every 14 days directly to your business bank account. Provide your secure bank account and routing information under the Seller Central settings window to receive Amazon Payments. Shipping Options: You’ll have the opportunity to select which worldwide regions you’re willing to ship to, as well as whether you will offer expedited shipping. Once your account is active, you’ll want to complete your public seller profile. Think of the seller profile as your Amazon-based social network profile for your business. This is where Amazon customers will get to know your company, view your shipping and return policies, review customer feedback, and more. “About Seller” Section: This is where you’ll introduce buyers to your business. Let them know who you are, tell the story of how your business got started, share your company philosophy, and add any other information that may give the buyer an emotional connection to you as a seller. Creating a sense of transparency through your “about seller” section will help you communicate trust, which can help buyers choose your listing over similar items available in the marketplace. Your Seller Logo: Customers will see your logo on your At a Glance page, on your storefront, and on the Offer Listing Page. Your logo must be 120×30 pixels in size and may not contain a URL or any reference to your own website within the image. Return and Refund Policies: Provide instructions for how customers should send you items they wish to return, include the address where the merchandise should be sent and the estimated time to process a refund. As you set your policies, keep in mind that Amazon policy requires sellers to allow returns for a minimum of 30 days. Once your seller profile is complete, you are ready to begin the process of listing and selling products on the Amazon Marketplace! Amazon breaks down its selling process into four simple steps: list, sell, ship, and get paid. Of course, the first three of these steps involve quite a few sub-steps and moving pieces, and there is definitely a learning curve to setting up and maintaining successfully selling inventory. But once you get the hang of it, selling on Amazon doesn’t have to be difficult. Add products to the Amazon Marketplace one at a time, or in large batches using your Professional selling subscription. Amazon’s seller central offers various options for product uploading. Your products sold on Amazon will fall into one of two categories: products already listed in the Amazon Marketplace, and new products for which you will be the first and/or only seller. If the product you’re listing is already on Amazon, you’ll be able to use the stock images and descriptions already on the site. You only have to indicate how many products you have to sell, describe the condition of the product(s), and select your available shipping options. To list multiple (more than 50) products which are already in the Amazon catalog, use the Excel formatted Listings Loader to fill in and upload the UPC/EAN codes for the products you wish to list. The UPC/EAN Number: a unique 12 or 13 digit bar code widely used to track products. Multiple listings from various sellers of the same product will have a single UPC/EAN number, and only one product detail listing will be created to match that unique number. If you need your own numbers, buy here. Product Description and Bullet Points: This is the description that informs the customer about your product and helps them make a buying decision. 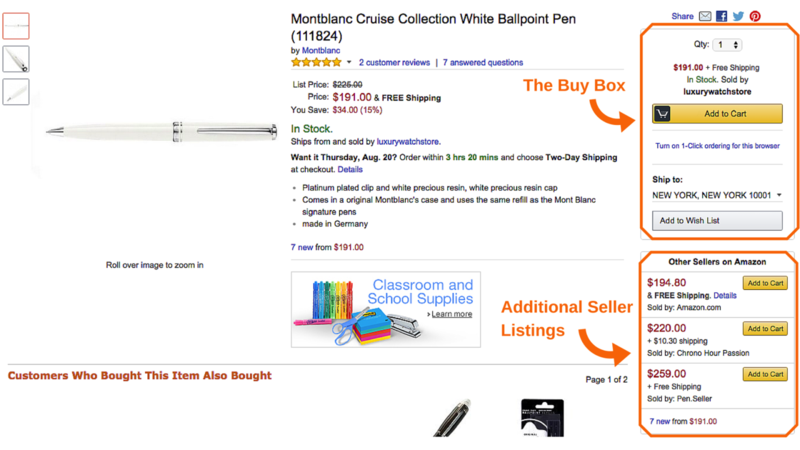 Use the bullet points as quick descriptive text to catch the buyer’s interest. The product description is the longer form area that provides a more thorough overview of your product. Product Images: High quality images are essential to a successful selling experience. Amazon requires that images be at least 500×500 pixels on pure white background without text or watermarks, and with the product taking up at least 80% of the image area. For best results, use well lit images of at least 1000×1000 pixels in size. Search Terms: For each new product that you list, Amazon gives you five fields of 50 characters each in which to list search terms. Each field can include several words—separated by spaces, not commas. Keep in mind that the product title, UPC, manufacturer, and merchant are automatically included in the search terms, so there’s no need to repeat these in the search fields. Once you’ve gathered your product information, you have a couple of options for uploading your new product listings. If you want to sell only few products (up to 50), you can add them using the Seller Central Add a Product tool. To add multiple products not yet listed in the Amazon catalog, go to Seller Central and download the Inventory File Excel template which corresponds to your primary product category. Then you’ll be able to fill in and upload details for all of your products from one central document. For your first bulk product listing, it’s a good idea to limit your number of individual products to about 20 items. This will keep you from losing too much time and energy if a data error prevents the upload from going through. Listings may be available to customers as soon as immediately after your upload is complete—but Amazon may take up to 24 hours to process your upload. If you don’t immediately see your new listing on the offer listing page, be patient and check back the next day for updates. If it still seems to be missing, contact Amazon through the Seller Portal, or use the FAQ to troubleshoot any upload errors. As soon as your listings are uploaded and have gone live on the Amazon marketplace, you can use the Seller Central website to manage all aspects of your selling account. Check for new orders, update your inventory, monitor your performance metrics, and much more. If you’ve primarily listed new products in the Amazon marketplace, the hardest part of getting started as a seller is already behind you. 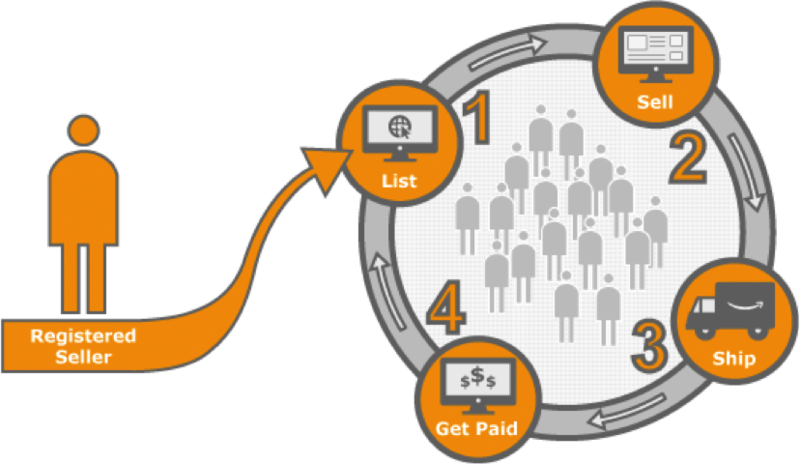 A key feature of the Amazon platform is that multiple sellers can offer the same product. If you’ve listed a product that is offered by more than one seller, each seller may compete to win the “Buy Box” for that product. The Buy Box is the area of the listing page for each product where customers can begin the purchasing process by adding items to their shopping carts. Although any given product may be available from multiple sellers, only one seller will “win” the Buy Box and be considered the default listing for the given product. Sellers who do not win the buy box may be eligible for the “More Buying Choices” box below, but Amazon does not guarantee placement in either of these locations. Pricing: Keep an eye on your competitors, and make sure you are pricing your products competitively. Buy Box listings most frequently display the lowest available “all in” prices—that is, the total amount the customer will pay including shipping costs. Availability: Use inventory planning best practices to keep your most popular products consistently in stock, and make sure you are regularly updating your inventory numbers in the Seller Central portal. You can not win the buy box for listings that are not currently in stock. Fulfillment: Update your shipping settings in Seller Central to offer multiple shipping speeds and options—and if at all possible, offer free shipping. The free shipping option is a hallmark of the Amazon brand, so it’s unlikely that sellers who charge for shipping will win the Buy Box over sellers who offer a free shipping option. Customer Service: Metrics showing the satisfaction of past customers directly impact your ability to win the Buy Box for future listings. Keep an eye on your customer feedback, and use the Account Health page in Performance section of seller central to monitor your customer metrics. Read on for more details on specific ways to improve your customer metrics over time. Ultimately, improving your listing placement on the Amazon Offer Listing Page requires trial and error and a little bit of time. Work to provide a top notch experience to the customers you have, and improve your logistical processes, and over time those efforts will show in your Buy Box placement in comparison to your competition. Fulfillment by Amazon: Products are stored in Amazon fulfillment centers around the country, and Amazon handles packaging and shipping products to customers. (Read below for more information about Amazon FBA). Seller Self-Shipping: You as the seller are responsible for maintaining inventory, packaging, labeling, and shipping products to individual customers. If you choose to fulfill orders yourself, Amazon will charge customers standard shipping rates for media products (books, music, video, DVD, software, and video games) sold by Professional Sellers, and to all products sold by Individual Sellers. The rates are determined based on the product category and shipping speed chosen by the buyer, and then deposited through the Amazon payments service to reimburse you for shipping costs. Unfortunately, this means if your shipping costs don’t match the platform rate, you lose the difference in any additional shipping costs you incurred. Amazon will deduct their fees and deposit payments into your bank account every 14 days, sending you an email notification when you have a new payment. It’s important to know when a new customer has purchased your product or service so that you can promptly satisfy the order. You’ll receive an email notification when you have a sale, but emails aren’t always reliable. Get in the habit of checking the Seller Central portal daily to determine whether you have any new orders or customer communications. Product sellers should always confirm on the Seller Central portal when an order has shipped. Amazon only charges your customer’s credit card after the shipment is confirmed, so this step is important to getting you paid for your products in a timely manner. Remember that you’re responsible for confirming shipment within the time frame that you specified in your shipping settings. To confirm that an order has been shipped, go to the Orders tab and select the Confirm Shipment button for the order in question. Especially if you’re selling your products in multiple channels (not just Amazon), it’s important to keep track of how much inventory you have in stock at all times. Realizing that you’re unexpectedly out of stock after and can’t fulfill an order is a recipe for negative customer feedback—which can have a dramatic impact on your future sales. When a buyer searches for your product, the offer listing page shows the lowest shipping inclusive priced items first. Shoppers are more likely to choose the lowest price deals listed closest to the top of the listing page, so if you hold a sale or lower your prices, make sure you update your product listings to reflect those changes. One of the benefits of partnering with the Amazon brand is the association with top notch reliability and customer service. As a new seller, you start with the benefit of Amazon’s built-in credibility—but it’s your responsibility to maintain that credibility by being highly reliable and responsive to customers. If an order is delayed, reach out promptly and proactively to the customer to let them know of the situation. Or if a customer contacts you because they didn’t receive an shipment or the product was damaged, respond promptly to the communication and take proactive steps to remedy the situation. Describe products accurately, in as much detail as possible. Ship products to customers as promptly as possible. Reach out to customers proactively with information about delays or changes to their order. Respond to customers’ questions within 24 hours. Solicit positive customer feedback on your product packing slips. According to experienced sellers, the single best way to ensure an excellent feedback rating and overall seller experience is by using the Fulfillment by Amazon service. In fact, a survey conducted in Q1 of 2012 indicated that 89% sellers using fulfillment by Amazon reported an increase in sales within the year period since switching to FBA—with 13% of those sellers reporting doubled sales volumes in a one year period. Read on for more information about using Fulfillment by Amazon to scale your online product sales. If the day-to-day of processing and shipping orders to customers feels overwhelming, Amazon’s fulfillment program may be the perfect fit for your needs. Through Amazon FBA, you can leverage Amazon’s world class fulfillment centers, customer support, and other operational tools to scale your business faster than you could ever do on your own. Basically, you send your products to Amazon, and they handle all the rest. Store your inventory within Amazon’s fulfillment centers around the world. When an order is placed, Amazon handles packaging and shipping the product to the customer— meaning all you have to do is make sure the fulfillment center is stocked with inventory. One of Amazon’s greatest pulls with customers is the availability of fast and free shipping through Amazon Prime or Super Saver shipping. Through the Amazon Prime subscription service, Prime subscribers enjoy free two day shipping on all eligible products listed on Amazon.com. When you choose to manage your products through Amazon FBA, your entire inventory becomes Prime eligible—a benefit that regularly leads to your listing being chosen first, ahead of competitors with similar listings. Even for customers who aren’t Prime subscribers, products managed by Amazon FBA are eligible for Free Super Saver Shipping on orders over $25. As a result, these listings benefit from better placement on the Amazon site than seller-fulfilled listings. Beyond the product placement and free shipping perks, the best part of using Fulfillment by Amazon is that it’s incredibly easy. Instead of handling the logistics of monitoring and fulfilling orders, tracking shipments, and handling customer service issues yourself, all you have to do is send your inventory to Amazon and let them handle the rest. To get started with fulfillment on Amazon, upload your product list onto Seller Central following the same steps you would use for a seller-shipped product. Then simply arrange to ship your full or partial inventory directly to Amazon, benefiting from Amazon’s reduced shipping rates. When your inventory is received, Amazon will store and manage your products within one or several of its 75+ fulfillment centers around the world. You still own the inventory and pay a storage fee for items stored until they are sold. You can use Amazon FBA to fulfill orders not just from the Amazon Marketplace, but from your own e-commerce site or other third party sites as well. This means you can keep a single pool of inventory in the FBA fulfillment centers and have a seamless sales and shipping experience regardless of where your product is sold online. Because Amazon FBA has no minimum unit count or flat rate subscription fees (beyond the monthly subscription you already pay as a Professional Amazon Seller), you only pay for the number and weight of units you actually store and ship to customers. As soon as an order is received, Amazon will package and ship your product directly to the customer with no action required from you. Once the order is shipped, Amazon will collect payment from the customer, deduct their fulfillment fee as a percentage of the total sale based on the weight and number of items, and deposit payments directly into your bank account every 14 days. Amazon serves as the direct customer service contact for customers on FBA products sold on Amazon to create a seamless buying experience. Of course, the many benefits of using Fulfillment by Amazon come with a significant price tag. For many businesses, the increased exposure and ease of scalability far outweigh the costs of using FBA. But ultimately, deciding whether to use the service is a matter of comparing FBA rates to the costs you would incur when fulfilling orders yourself. Let’s break down exactly how fees for Fulfillment by Amazon are calculated. Keep in mind, these fees are in addition to the normal monthly Professional seller subscription and fees you already incur as an Amazon seller. Order Handling: The cost of handling for orders placed on Amazon is $1.00 per order for standard size, non-media items. Standard size media items receive free order handling. Picking and Packing: Fees for Pick & Pack services are calculated per unit ordered by a customer, so you only pay these fees when you receive a sale. While these rates vary by product type, average rates hover around $1 per order fulfilled on Amazon. Weight Handling: To account for the processing and shipment of overweight products, Amazon charges a weight handling fee of $1.59 per pound per unit ordered by a customer. Again, you only pay weight handling fees when you make a sale. Storage: Fees for storage are calculated per cubic foot per month, and vary by product type, size, and time of year. Average storage fees for standard size items may be as low as $0.51 per cubic foot per month. Amazon defines standard-size products to include any packaged unit that is 20 lb. or less with its longest side 18″ or less, its shortest side 8″ or less, and its median side 14″ or less. Any unit product exceeding any of these dimensions is considered oversize, and will incur special processing fees. In addition to higher Pick & Pack and Weight Handling fees, some oversize products may incur a “special handling” fee averaging $40 per shipment. Not sure whether using Fulfillment by Amazon is the right choice for your bottom line? Check out Amazon’s handy revenue calculator to weigh the dollars and cents of using FBA for your particular products. By now, most retailers, wholesalers, product designers and manufacturers are aware of the impact of Amazon on the product marketplace—and they know how selling their products on amazon can benefit their business. But if you are a service professional providing any type of B2C service, did you know that you could also use Amazon to grow your business? The company recently launched Amazon Home Services to allow Amazon customers to source any type of professional services—from handymen, to carpet cleaners, to yoga instructors—through the Amazon.com portal. Here’s a quick breakdown of the types of professionals currently listing their services on Amazon, and this list is growing regularly. Are you a handyman, a fitness instructor, or any other type of home service professional? Here’s what you need to know in order to get started selling your services on Amazon.com. Amazon Home Services is essentially an online marketplace for service providers throughout the U.S. Amazon customers can use the service to quickly and easily source a variety of services. Right now the most common requests are for assembly and installation of products purchased on Amazon, but Amazon is quickly expanding into a variety of service categories. 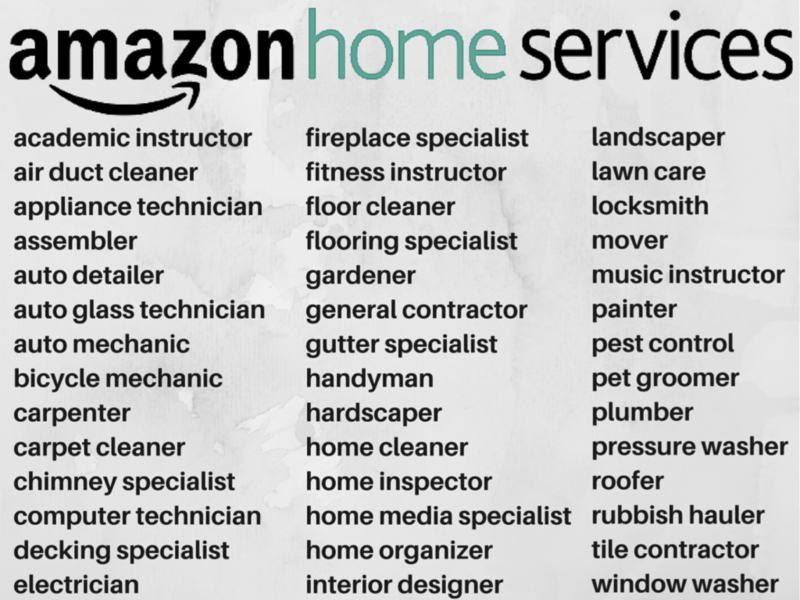 Check out the Amazon Home Services Storefront to see how customers navigate services, and to determine what other service providers are currently participating in your neighborhood. Once you’ve been accepted as an Amazon Service Provider, you’ll be able to create your storefront, which is the profile page where customers can learn more about your company. You can write an introduction to your business, specify your service area by zip code, collect customer reviews, and more to differentiate your business from the local competition. Amazon has created set pre-packages for various service categories based on the most common service requests they see from customers. Once you’ve signed up as a seller, you can choose which of these services to offer, set your prices, and even specify the exact zip codes in which you’ll offer these services. Once you’ve set your packages, customers can click to order these packages on Amazon.com at any time, and you’ll receive an email notification when a new order is placed. Through the Amazon Seller Central portal, you can schedule services online, set up automated communications with customers, manage your packages, prices, and payments, and much more. Amazon’s simple processes take a huge amount of guess work out of the back-end business management that most service providers have to deal with on their own. Occasionally, a customer in your neighborhood may be interested in a service that is within your expertise, but doesn’t exactly fit within one of your pre-packaged options. In these cases, Amazon offers custom service requests. When a customer makes a custom service request, you’ll receive the request via email and have 24 hours to respond with a bid. If the customer accepts the bid, you’ll proceed with the order as usual, with Amazon continuing to handle scheduling, billing, and payment processing. Payment for services sold through Amazon Home Services is automatically handled through Amazon Payments, so you don’t have to deal with invoicing or collecting from your customers. Once a job is completed, Amazon simply deducts their fees, then you receive payment directly into your bank account. Transaction Fee—5% of each transaction—includes the costs of invoicing, payment processing, and fraud protection. Platform Fee—between 10% and 20% of each transaction—covers marketing and advertising costs, seller tools, and customer service. Your total cost of these fees will of course depend on the price of your service, but also the category that your service falls into. These are the packages that you create ahead of time for customers to purchase. They’ll likely be the most common packages or service requests that you already receive from your customers. Amazon will advertise those as a package, and collect fees when you book a customer. For Pre-packaged services, Amazon collects 20% for the portion of the service price up to $1K (5% Transaction fee and 15% Service Platform fee), and 15% for the portion of the service price greater than $1K (5% Transaction fee and 10% Service Platform fee). Amazon understands that occasionally, customers will have a specific service request that doesn’t fit within one of your pre-packaged options. Because Amazon isn’t specifically advertising these custom services on your behalf, they charge slightly lower platform fees for these transactions. Fees for Custom Services amount to 15% for the portion of the service price up to $1K (5% Transaction fee and 10% Service Platform fee), and 10% for the portion of the service price greater than $1K (5% Transaction fee and 5% Service Platform fee). If a customer booked through Amazon Home Services books your company for a recurring service (such as weekly fitness training sessions or monthly carpet cleaning services), Amazon collects 10% of service price for completed orders over $1K (5% Transaction fee and 5% Service Platform fee). All transaction and platform fees are collected as a percentage of the service price, excluding any taxes collected through Amazon tax collection services. Beginning in 2016, Amazon will charge an additional, one time flat rate fee of $50 to conduct background checks on businesses selling through Amazon Home Services. Additionally, businesses whose services involve employees going into customers’ homes to complete a service will pay $40 per participating employee for individual background checks. Currently, selling services on Amazon is an invite-only program—but you can notify Amazon of your interest in participating as a seller by completing an application. If you are accepted, you will receive an e-mail from Amazon with an activation code and instructions for getting started. Want to know even more about selling your company’s services through Amazon Home Services? Check out their handy FAQ section for more info. There’s a whole world out there just waiting to pay for your products—but if you’ve never before navigated the world of exporting, figuring out how to sell to international customers can be intimidating. But with 11 global marketplaces, 109 worldwide fulfillment centers, and buying customers in 180 countries, Amazon makes it easy to break into international exporting without having to reinvent the wheel. Let Amazon help you navigate shipping internationally for yourself, or use Fulfillment by Amazon to quickly and easily fulfill international orders on the Global Amazon Marketplace. Your Amazon Global Selling portal can even help you navigate tax and regulatory considerations for the countries you may be shipping to. Whether you’re distributing products or marketing your services; whether you’re growing your international business or focusing on domestic sales—the brand recognition and logistical provisions of the Amazon network are an incredible tool for expanding your business for beyond what you’d likely have the logistical capacity to achieve on your own. While the costs associated with using Amazon to sell and distribute your products and services do certainly take a notch out of your bottom line profit margin, the regularly increased sales volume that the majority of users experience as a result of choosing to sell on Amazon are almost always worth the associated costs.